Proven world oil reserves, 2013. Note that here unconventional reservoirs such as natural heavy oil and tar sands are included. Petroleum (zooplankton and algae, are buried underneath sedimentary rock and subjected to intense heat and pressure. Concern over the depletion of the earth's finite reserves of oil, and the effect this would have on a society dependent on it, is a concept known as peak oil. The use of fossil fuels, such as petroleum, has a negative impact on Earth's biosphere, damaging ecosystems through events such as oil spills and releasing a range of pollutants into the air including ground-level ozone and sulfur dioxide from sulfur impurities in fossil fuels. Burning fossil fuels in particular releases carbon dioxide, a powerful greenhouse gas which is the main cause of man-made global warming. The word petroleum comes from cannel coal (and later oil shale), and refined oils produced from them; in the United Kingdom, storage (and later transport) of these oils were regulated by a series of Petroleum Acts, from the Petroleum Act 1863 onwards. Petroleum, in one form or another, has been used since ancient times, and is now important across society, including in economy, politics and technology. The rise in importance was due to the invention of the internal combustion engine, the rise in commercial aviation, and the importance of petroleum to industrial organic chemistry, particularly the synthesis of plastics, fertilizers, solvents, adhesives and pesticides. The production of these oils and solid paraffin wax from coal formed the subject of his patent dated 17 October 1850. In 1850 Young & Meldrum and Edward William Binney entered into partnership under the title of E.W. Binney & Co. at Bathgate in West Lothian and E. Meldrum & Co. at Glasgow; their works at Bathgate were completed in 1851 and became the first truly commercial oil-works in the world with the first modern oil refinery, using oil extracted from locally-mined torbanite, shale, and bituminous coal to manufacture naphtha and lubricating oils; paraffin for fuel use and solid paraffin were not sold until 1856. Another early refinery was built by Ignacy Łukasiewicz, providing a cheaper alternative to whale oil. The demand for petroleum as a fuel for lighting in North America and around the world quickly grew. Edwin Drake's 1859 well near Titusville, Pennsylvania, is popularly considered the first modern well. Drake's well is probably singled out because it was drilled, not dug; because it used a steam engine; because there was a company associated with it; and because it touched off a major boom. However, there was considerable activity before Drake in various parts of the world in the mid-19th century. A group directed by Major Alexeyev of the Bakinskii Corps of Mining Engineers hand-drilled a well in the Baku region in 1848. There were engine-drilled wells in West Virginia in the same year as Drake's well. An early commercial well was hand dug in Poland in 1853, and another in nearby Romania in 1857. At around the same time the world's first, small, oil refinery was opened at Jasło in Poland, with a larger one opened at Ploiești in Romania shortly after. Romania is the first country in the world to have had its annual crude oil output officially recorded in international statistics: 275 tonnes for 1857. 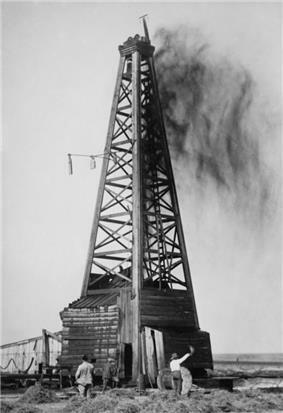 The  The discovery at Oil Springs touched off an oil boom which brought hundreds of speculators and workers to the area. Advances in drilling continued into 1862 when local driller Shaw reached a depth of 62 metres using the spring-pole drilling method. On January 16, 1862, after an explosion of natural gas Canada's first oil gusher came into production, shooting into the air at a recorded rate of 3,000 barrels per day. By the end of the 19th century the Russian Empire, particularly the Branobel company in Azerbaijan, had taken the lead in production. Today, about 90 percent of vehicular fuel needs are met by oil. Petroleum also makes up 40 percent of total energy consumption in the United States, but is responsible for only 1 percent of electricity generation. Petroleum's worth as a portable, dense energy source powering the vast majority of vehicles and as the base of many industrial chemicals makes it one of the world's most important commodities. Viability of the oil commodity is controlled by several key parameters, number of vehicles in the world competing for fuel, quantity of oil exported to the world market (Export Land Model), Net Energy Gain (economically useful energy provided minus energy consumed), political stability of oil exporting nations and ability to defend oil supply lines. 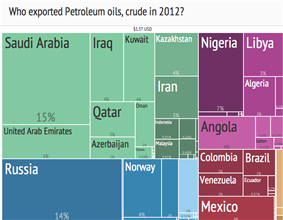 The top three oil producing countries are Russia, Saudi Arabia and the United States. About 80 percent of the world's readily accessible reserves are located in the Middle East, with 62.5 percent coming from the Arab 5: Saudi Arabia, UAE, Iraq, Qatar and Kuwait. A large portion of the world's total oil exists as unconventional sources, such as bitumen in Canada and extra heavy oil in Venezuela. While significant volumes of oil are extracted from oil sands, particularly in Canada, logistical and technical hurdles remain, as oil extraction requires large amounts of heat and water, making its net energy content quite low relative to conventional crude oil. Thus, Canada's oil sands are not expected to provide more than a few million barrels per day in the foreseeable future. In its strictest sense, petroleum includes only crude oil, but in common usage it includes all liquid, gaseous, and solid hydrocarbons. Under surface pressure and temperature conditions, lighter hydrocarbons methane, ethane, propane and butane occur as gases, while pentane and heavier ones are in the form of liquids or solids. However, in an underground oil reservoir the proportions of gas, liquid, and solid depend on subsurface conditions and on the phase diagram of the petroleum mixture. 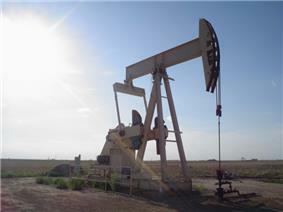 An oil well produces predominantly crude oil, with some natural gas dissolved in it. Because the pressure is lower at the surface than underground, some of the gas will come out of solution and be recovered (or burned) as associated gas or solution gas. A gas well produces predominantly natural gas. However, because the underground temperature and pressure are higher than at the surface, the gas may contain heavier hydrocarbons such as pentane, hexane, and heptane in the gaseous state. At surface conditions these will condense out of the gas to form natural gas condensate, often shortened to condensate. Condensate resembles petrol in appearance and is similar in composition to some volatile light crude oils. The proportion of light hydrocarbons in the petroleum mixture varies greatly among different oil fields, ranging from as much as 97 percent by weight in the lighter oils to as little as 50 percent in the heavier oils and bitumens. Most of the world's oils are non-conventional. Four different types of hydrocarbon molecules appear in crude oil. 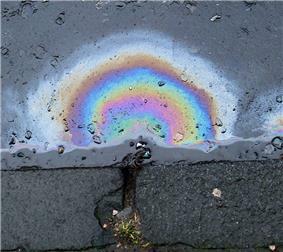 The relative percentage of each varies from oil to oil, determining the properties of each oil. Crude oil varies greatly in appearance depending on its composition. It is usually black or dark brown (although it may be yellowish, reddish, or even greenish). In the reservoir it is usually found in association with natural gas, which being lighter forms a gas cap over the petroleum, and saline water which, being heavier than most forms of crude oil, generally sinks beneath it. Crude oil may also be found in semi-solid form mixed with sand and water, as in the Athabasca oil sands in Canada, where it is usually referred to as crude bitumen. In Canada, bitumen is considered a sticky, black, tar-like form of crude oil which is so thick and heavy that it must be heated or diluted before it will flow. Venezuela also has large amounts of oil in the Orinoco oil sands, although the hydrocarbons trapped in them are more fluid than in Canada and are usually called extra heavy oil. These oil sands resources are called unconventional oil to distinguish them from oil which can be extracted using traditional oil well methods. Between them, Canada and Venezuela contain an estimated 3.6 trillion barrels (570×10^9 m3) of bitumen and extra-heavy oil, about twice the volume of the world's reserves of conventional oil. Petroleum is used mostly, by volume, for producing fuel oil and petrol, both important "primary energy" sources. 84 percent by volume of the hydrocarbons present in petroleum is converted into energy-rich fuels (petroleum-based fuels), including petrol, diesel, jet, heating, and other fuel oils, and liquefied petroleum gas. The lighter grades of crude oil produce the best yields of these products, but as the world's reserves of light and medium oil are depleted, oil refineries are increasingly having to process heavy oil and bitumen, and use more complex and expensive methods to produce the products required. Because heavier crude oils have too much carbon and not enough hydrogen, these processes generally involve removing carbon from or adding hydrogen to the molecules, and using fluid catalytic cracking to convert the longer, more complex molecules in the oil to the shorter, simpler ones in the fuels. Due to its high energy density, easy transportability and relative abundance, oil has become the world's most important source of energy since the mid-1950s. Petroleum is also the raw material for many chemical products, including pharmaceuticals, solvents, fertilizers, pesticides, and plastics; the 16 percent not used for energy production is converted into these other materials. Petroleum is found in porous rock formations in the upper strata of some areas of the Earth's crust. There is also petroleum in oil sands (tar sands). Known oil reserves are typically estimated at around 190 km3 (1.2 trillion (short scale) barrels) without oil sands, or 595 km3 (3.74 trillion barrels) with oil sands. Consumption is currently around 84 million barrels (13.4×10^6 m3) per day, or 4.9 km3 per year. Which in turn yields a remaining oil supply of only about 120 years, if current demand remain static. Octane, a hydrocarbon found in petroleum. Lines represent single bonds; black spheres represent carbon; white spheres represent hydrogen. Petroleum is a mixture of a very large number of different hydrocarbons; the most commonly found molecules are alkanes (paraffins), cycloalkanes (naphthenes), aromatic hydrocarbons, or more complicated chemicals like asphaltenes. Each petroleum variety has a unique mix of molecules, which define its physical and chemical properties, like color and viscosity. The alkanes, also known as paraffins, are saturated hydrocarbons with straight or branched chains which contain only carbon and hydrogen and have the general formula CnH2n+2. They generally have from 5 to 40 carbon atoms per molecule, although trace amounts of shorter or longer molecules may be present in the mixture. The alkanes from pentane (C5H12) to octane (C8H18) are refined into petrol, the ones from nonane (C9H20) to hexadecane (C16H34) into diesel fuel, kerosene and jet fuel. Alkanes with more than 16 carbon atoms can be refined into fuel oil and lubricating oil. At the heavier end of the range, paraffin wax is an alkane with approximately 25 carbon atoms, while asphalt has 35 and up, although these are usually cracked by modern refineries into more valuable products. The shortest molecules, those with four or fewer carbon atoms, are in a gaseous state at room temperature. They are the petroleum gases. Depending on demand and the cost of recovery, these gases are either flared off, sold as liquified petroleum gas under pressure, or used to power the refinery's own burners. During the winter, butane (C4H10), is blended into the petrol pool at high rates, because its high vapor pressure assists with cold starts. Liquified under pressure slightly above atmospheric, it is best known for powering cigarette lighters, but it is also a main fuel source for many developing countries. Propane can be liquified under modest pressure, and is consumed for just about every application relying on petroleum for energy, from cooking to heating to transportation. The cycloalkanes, also known as naphthenes, are saturated hydrocarbons which have one or more carbon rings to which hydrogen atoms are attached according to the formula CnH2n. Cycloalkanes have similar properties to alkanes but have higher boiling points. The aromatic hydrocarbons are unsaturated hydrocarbons which have one or more planar six-carbon rings called benzene rings, to which hydrogen atoms are attached with the formula CnHn. They tend to burn with a sooty flame, and many have a sweet aroma. Some are carcinogenic. The number of various molecules in an oil sample can be determined in laboratory. The molecules are typically extracted in a solvent, then separated in a gas chromatograph, and finally determined with a suitable detector, such as a flame ionization detector or a mass spectrometer. Due to the large number of co-eluted hydrocarbons within oil, many cannot be resolved by traditional gas chromatography and typically appear as a hump in the chromatogram. This unresolved complex mixture (UCM) of hydrocarbons is particularly apparent when analysing weathered oils and extracts from tissues of organisms exposed to oil. Incomplete combustion of petroleum or petrol results in production of toxic byproducts. Too little oxygen results in carbon monoxide. Due to the high temperatures and high pressures involved, exhaust gases from petrol combustion in car engines usually include nitrogen oxides which are responsible for creation of photochemical smog. Q_v = 12400, - 2,100d^2. where Q_v is measured in cal/gram and d is the specific gravity at 60 °F (16 °C). where K is measured in BTU · °F−1hr−1ft−1 , t is measured in °F and API is degrees API gravity. where c is measured in BTU/lbm-°F, t is the temperature in Fahrenheit and d is the specific gravity at 60 °F (16 °C). where the temperature t is in Celsius and d is the specific gravity at 15 °C. where L is measured in BTU/lbm, t is measured in °F and d is the specific gravity at 60 °F (16 °C). Structure of a vanadium chlorophyll a (right). Petroleum is a kerogen, which is found in various oil shales around the world, and then with more heat into liquid and gaseous hydrocarbons via a process known as catagenesis. Formation of petroleum occurs from hydrocarbon pyrolysis in a variety of mainly endothermic reactions at high temperature and/or pressure. Akiner, Shirin; Aldis, Anne, ed. (2004). The Caspian: Politics, Energy and Security. New York: Routledge. Hyne, Norman J. (2001). Nontechnical Guide to Petroleum Geology, Exploration, Drilling, and Production. PennWell Corporation. Mabro, Robert; Organization of Petroleum Exporting Countries (2006). Oil in the 21st century: issues, challenges and opportunities. Oxford Press. Maugeri, Leonardo (2005). The Age of Oil: What They Don't Want You to Know About the World's Most Controversial Resource. Guilford, CT: Globe Pequot. p. 15. Speight, James G. (1999). The Chemistry and Technology of Petroleum. Marcel Dekker. Speight, James G; Ancheyta, Jorge, ed. (2007). Hydroprocessing of Heavy Oils and Residua. CRC Press. Vassiliou, Marius (2009). Historical Dictionary of the Petroleum Industry. Scarecrow Press (Rowman & Littlefield). ^ The Latin word petra is a loanword from Greek πέτρα. ^ "Gasoline as Fuel – History of Word Gasoline – Gasoline and Petroleum Origins". Alternativefuels.about.com. 2013-07-12. Retrieved 2013-08-27. ^ EIA Energy Kids - Oil (petroleum). Eia.gov. Retrieved on 2013-11-26. ^ Guerriero V. et al. (2012). "A permeability model for naturally fractured carbonate reservoirs". Marine and Petroleum Geology (Elsevier) 40: 115–134. ^ Guerriero V. et al. (2011). "Improved statistical multi-scale analysis of fractures in carbonate reservoir analogues". ^ "Organic Hydrocarbons: Compounds made from carbon and hydrogen". Archived from the original on July 19, 2011. ^ "Libyan tremors threaten to rattle the oil world". The Hindu (Chennai, India). March 1, 2011. ^ Oxford English Dictionary online edition, entry "petroleum"
^ Russell, Loris S. (2003). A Heritage of Light: Lamps and Lighting in the Early Canadian Home. University of Toronto Press. ^ Matveichuk, Alexander A. Intersection of Oil Parallels: Historical Essays. Moscow: Russian Oil and Gas Institute, 2004. ^ McKain, David L., and Bernard L. Allen. Where It All Began: The Story of the People and Places Where the Oil Industry Began—West Virginia and South- eastern Ohio. Parkersburg, W.Va.: David L. McKain, 1994. ^ Hanson Baldwin, 1959, "Oil Strategy in World War II", American Petroleum Institute Quarterly – Centennial Issue, pages 10–11. American Petroleum Institute. ^ "InfoPlease". InfoPlease. Retrieved August 29, 2010. ^ a b Hyne (2001), pp. 1–4. ^ Speight (1999), p. 215–216. ^ Alboudwarej et al. (Summer 2006). "Highlighting Heavy Oil" (PDF). Oilfield Review. Retrieved July 4, 2012. ^ "Oil Sands – Glossary". Mines and Minerals Act. Government of Alberta. 2007. Archived from the original on November 1, 2007. Retrieved October 2, 2008. ^ "Oil Sands in Canada and Venezuela". Infomine Inc. 2008. Retrieved October 2, 2008. ^ "Crude oil is made into different fuels". Eia.doe.gov. Retrieved August 29, 2010. ^ "EIA reserves estimates". Eia.doe.gov. Retrieved August 29, 2010. ^ "CERA report on total world oil". Cera.com. November 14, 2006. Retrieved August 29, 2010. ^ "Heat of Combustion of Fuels". Webmo.net. Retrieved August 29, 2010. ^ Use of ozone depleting substances in laboratories. TemaNord 2003:516. ^ Speight (2007), p. 25. ^ United States Bureau of Standards, "Thermal Properties of Petroleum Products". Miscellaneous Publication No. 97, November 9, 1929. ^ Treibs, A.E. (1936). "Chlorophyll- und Häminderivate in organischen Mineralstoffen". Angew. Chem. 49 (38): 682–686. ^ Kvenvolden, K. A. (2006). "Organic geochemistry – A retrospective of its first 70 years". Org. Geochem. 37: 1–11. ^ Kvenvolden, Keith A. (2006). "Organic geochemistry – A retrospective of its first 70 years". Organic Geochemistry 37: 1. ^ Braun, Robert L.; Burnham, lan K. (June 1993). "Chemical Reaction Model for Oil and Gas Generation from Type I and Type II Kerogen". Lawrence Livermore National Laboratory. Retrieved August 29, 2010. ^ Broad, William J. (August 2, 2010). "Tracing Oil Reserves to Their Tiny Origins". The New York Times. Retrieved August 2, 2010. ^ Polar Prospects:A minerals treaty for Antarctica. United States, Office of Technology Assessment. September 1989. p. 104. ^ Lambertson, Giles (February 16, 2008). "Oil Shale: Ready to Unlock the Rock". Construction Equipment Guide. Retrieved May 21, 2008. ^ "Chevron Crude Oil Marketing – North America Posted Pricing – California". Crudemarketing.chevron.com. May 1, 2007. Retrieved August 29, 2010. ^ "Light Sweet Crude Oil". About the Exchange. New York Mercantile Exchange (NYMEX). 2006. Archived from the original on March 14, 2008. Retrieved April 21, 2008. ^ "International Energy Annual 2004" (XLS). Energy Information Administration. July 14, 2006. ^ "Yearbook 2008 – crude oil". Energy data. ^ "About Us". Western States Petroleum Association. Archived from the original on June 16, 2008. Retrieved November 3, 2008. ^ a b "A liquid market: Thanks to LNG, spare gas can now be sold the world over". The Economist. 14 July 2012. Retrieved 6 January 2013. ^ a b c Mabro (2006), p. 351. ^ Speight (1999), p. 543. ^ Simanzhenkov, Vasily; Idem, Raphael (2003). Crude Oil Chemistry. CRC Press,. p. 33. ^ "IBGE". IBGE. Retrieved August 29, 2010. 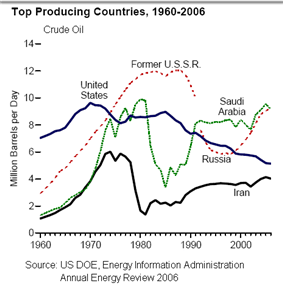 ^ "World Crude Oil Production" (PDF). Retrieved August 29, 2010. ^ "U.S. may soonbecome world's top oil producer". CBS News. 23 October 2012. Retrieved 9 February 2013. ^ Mark Thompson (12 November 2012). "U.S. to become biggest oil producer – IEA". CNN. Retrieved 9 February 2013. ^ "AEO2014 EARLY RELEASE OVERVIEW" Early report US Energy Information Administration, December 2013. Accessed: December 2013. Quote:"Domestic production of crude oil .. increases sharply .. is expected to level off and then slowly decline after 2020"
^ Historical trends in carbon dioxide concentrations and temperature, on a geological and recent time scale. (June 2007). In UNEP/GRID-Arendal Maps and Graphics Library. Retrieved 19:14, February 19, 2011. ^ Deep ice tells long climate story. Retrieved 19:14, February 19, 2011. ^ Mitchell John F. B. (1989). "The "Greenhouse" Effect and Climate Change". Reviews of Geophysics 27 (1): 115–139. ^ "Arctic Sea Ice Reaches New Low, Shattering Record Set Just 3 Weeks Ago." NBCNews.com, 19 Sept. 2012. Web. 1 Oct. 2012. .
^ "Pumping of the Erika cargo". Total.com. Retrieved August 29, 2010. ^ Sims, Gerald K.; O'Loughlin, Edward J.; Crawford, Ronald L. (1989). "Degradation of pyridines in the environment". Critical Reviews in Environmental Control (Taylor & Francis) 19 (4): 309–340. ^ a b Itah A. Y. and Essien J. P. (Oct 2005). "Growth Profile and Hydrocarbonoclastic Potential of Microorganisms Isolated from Tarballs in the Bight of Bonny, Nigeria". World Journal of Microbiology and Biotechnology (Kluwer Academic) 21 (6–7): 1317–1322. ^ Drew Jubera (August 1987). "Texas Primer: The Tar Ball". Texas Monthly. Retrieved 2014-10-20. ^ Knap Anthony H, Burns Kathryn A, Dawson Rodger, Ehrhardt Manfred, and Palmork Karsten H (Dec 1984). "Dissolved/dispersed hydrocarbons, tarballs and the surface microlayer: Experiences from an IOC/UNEP Workshop in Bermuda". Marine Pollution Bulletin 17 (7): 313–319. ^ How Capitalism Saved the Whales by James S. Robbins, The Freeman, August, 1992. ^ Chris Hogg (February 10, 2009). "China's car industry overtakes US". BBC News. ^ OPEC Secretariat (2008). "World Oil Outlook 2008". ^ Ni Weiling (October 16, 2006). "Daqing Oilfield rejuvenated by virtue of technology". ^ Campbell CJ (December 2000). "Peak Oil Presentation at the Technical University of Clausthal". ^ Hubbert, Marion King; Shell Development Company (1956). "Nuclear energy and the fossil fuels". Drilling and Production Practice (Washington, DC: American Petroleum Institute) 95. ^ "New study raises doubts about Saudi oil reserves". Iags.org. March 31, 2004. Retrieved August 29, 2010. ^ Peak Oil Info and Strategies "The only uncertainty about peak oil is the time scale, which is difficult to predict accurately." ^ "Military Study Warns of a Potentially Drastic Oil Crisis". Spiegel Online. September 1, 2010. ^ U.S. Crude Oil Production Forecast- Analysis of Crude Types, Washington, DC: U.S. Energy Information Administration, 29 May 2014, retrieved 31 May 2014, U.S. oil production has grown rapidly in recent years. U.S. Energy Information Administration (EIA) data, which reflect combined production of crude oil and lease condensate, show a rise from 5.7 million barrels per day (bbl/d) in 2011 to 7.4 million bbl/d in 2013. EIA's Short-Term Energy Outlook (STEO) projects continuing rapid production growth in 2014 and 2015, with forecast production in 2015 reaching 9.2 million bbl/d. Beyond 2015, EIA's Annual Energy Outlook (AEO) projects further production growth, although its pace and duration remain uncertain. Domestic production plateaus near 9.6 million bbl/d between 2017 and 2020, close to its historic high of 9.6 million bbl/d in 1970, in the AEO2014 Reference case. In the AEO2014 High Oil and Gas Resource case, growth continues through the 2020s and into the 2030s, with production reaching 13.3 million barrels per day in 2036. The calculus for peak oil has changed with the introduction of unconventional production methods. In particular, the combination of horizontal drilling and hydraulic fracturing has resulted in a significant increase in production from previously uneconomic plays. Certain rock strata contain hydrocarbons but have low permeability and are not thick from a vertical perspective. Conventional vertical wells would be unable to economically retrieve these hydrocarbons. Horizontal drilling, extending horizontally through the strata, permits the well to access a much greater volume of the strata. Hydraulic fracturing creates greater permeability and increases hydrocarbon flow to the wellbore. The International Energy Agency (IEA) said in 2010 that production of conventional crude oil had peaked in 2006 at 70 MBBL/d, then flattened at 68 or 69 thereafter. Since virtually all economic sectors rely heavily on petroleum, peak oil, if it were to occur, could lead to a "partial or complete failure of markets". It is difficult to predict the oil peak in any given region, due to the lack of knowledge and/or transparency in accounting of global oil reserves. Based on available production data, proponents have previously predicted the peak for the world to be in years 1989, 1995, or 1995–2000. Some of these predictions date from before the recession of the early 1980s, and the consequent reduction in global consumption, the effect of which was to delay the date of any peak by several years. Just as the 1971 U.S. peak in oil production was only clearly recognized after the fact, a peak in world production will be difficult to discern until production clearly drops off. The peak is also a moving target as it is now measured as "liquids", which includes synthetic fuels, instead of just conventional oil. Hubbert applied his theory to accurately predict the peak of U.S. conventional oil production at a date between 1966 and 1970. This prediction was based on data available at the time of his publication in 1956. In the same paper, Hubbert predicts world peak oil in "half a century" after his publication, which would be 2006. Peak oil is the projection that future petroleum production (whether for individual oil wells, entire oil fields, whole countries, or worldwide production) will eventually peak and then decline at a similar rate to the rate of increase before the peak as these reserves are exhausted. The peak of oil discoveries was in 1965, and oil production per year has surpassed oil discoveries every year since 1980. Consumption in the twentieth and twenty-first centuries has been abundantly pushed by automobile growth; the 1985–2003 oil glut even fueled the sales of low economy vehicles in OECD countries. The 2008 economic crisis seems to have had some impact on the sales of such vehicles; still, the 2008 oil consumption shows a small increase. The BRIC countries might also kick in, as China briefly was the first automobile market in December 2009. The immediate outlook still hints upwards. In the long term, uncertainties linger; the OPEC believes that the OECD countries will push low consumption policies at some point in the future; when that happens, it will definitely curb oil sales, and both OPEC and EIA kept lowering their 2020 consumption estimates during the past 5 years. Oil products are more and more in competition with alternative sources, mainly coal and natural gas, both cheaper sources. Production will also face an increasingly complex situation; while OPEC countries still have large reserves at low production prices, newly found reservoirs often lead to higher prices; offshore giants such as Tupi, Guara and Tiber demand high investments and ever-increasing technological abilities. Subsalt reservoirs such as Tupi were unknown in the twentieth century, mainly because the industry was unable to probe them. Enhanced Oil Recovery (EOR) techniques (example: DaQing, China ) will continue to play a major role in increasing the world's recoverable oil. 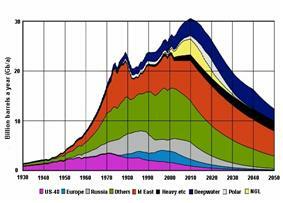 US oil production and imports, 1910-2012. 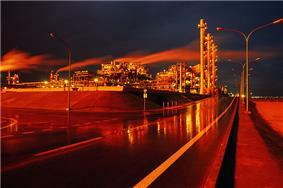 In oil producing countries with little refinery capacity, oil is sometimes burned to produce electricity. Renewable energy technologies such as solar power, wind power, micro hydro, biomass and biofuels are used, but the primary alternatives remain large-scale hydroelectricity, nuclear and coal-fired generation. Biological feedstocks do exist for industrial uses such as Bioplastic production. Vehicles that use alternative fuels used in standard or modified internal combustion engines such as natural gas vehicles, neat ethanol vehicles, flexible-fuel vehicles, biodiesel-powered vehicles, and hydrogen vehicles. Vehicles with advanced propulsion systems that reduce or substitute petroleum use such as battery electric vehicles, plug-in hybrid electric vehicles, hybrid electric vehicles, and hydrogen fuel cell vehicles. Brazilian fuel station with four alternative fuels for sale: diesel (B3), gasohol (E25), neat ethanol (E100), and compressed natural gas (CNG). 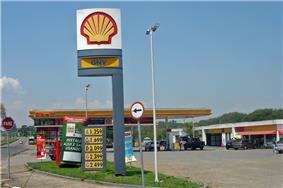 In the United States in 2007 about 70 percent of petroleum was used for transportation (e.g. petrol, diesel, jet fuel), 24 percent by industry (e.g. production of plastics), 5 percent for residential and commercial uses, and 2 percent for electricity production. Outside of the US, a higher proportion of petroleum tends to be used for electricity. James S. Robbins has argued that the advent of petroleum-refined kerosene saved some species of great whales from extinction by providing an inexpensive substitute for whale oil, thus eliminating the economic imperative for open-boat whaling. A tarball is a blob of crude oil (not to be confused with tar, which is a man-made product derived from pine trees or refined from petroleum) which has been weathered after floating in the ocean. Tarballs are an aquatic pollutant in most environments, although they can occur naturally, for example in the Santa Barbara Channel of California or in the Gulf of Mexico off Texas. 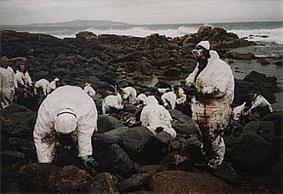 Their concentration and features have been used to assess the extent of oil spills. Their composition can be used to identify their sources of origin, and tarballs themselves may be dispersed over long distances by deep sea currents. They are slowly decomposed by bacteria, including Chromobacterium violaceum, Cladosporium resinae, Bacillus submarinus, Micrococcus varians, Pseudomonas aeruginosa, Candida marina and Saccharomyces estuari. Though crude oil is predominantly composed of various hydrocarbons, certain nitrogen heterocylic compounds, such as pyridine, picoline, and quinoline are reported as contaminants associated with crude oil, as well as facilities processing oil shale or coal, and have also been found at legacy wood treatment sites. These compounds have a very high water solubility, and thus tend to dissolve and move with water. Certain naturally occurring bacteria, such as Micrococcus, Arthrobacter, and Rhodococcus have been shown to degrade these contaminants. Control of oil spills is difficult, requires ad hoc methods, and often a large amount of manpower. The dropping of bombs and incendiary devices from aircraft on SS Torrey Canyon wreck produced poor results; modern techniques would include pumping the oil from the wreck, like in the Prestige oil spill or the Erika oil spill. Oil spills at sea are generally much more damaging than those on land, since they can spread for hundreds of nautical miles in a thin bulldozed around the spill site before most of the oil escapes, and land animals can avoid the oil more easily. Crude oil and refined fuel spills from tanker ship accidents have damaged natural ecosystems in Alaska, the Gulf of Mexico, the Galapagos Islands, France and many other places. Oil extraction is simply the removal of oil from the reservoir (oil pool). Oil is often recovered as a water-in-oil emulsion, and specialty chemicals called demulsifiers are used to separate the oil from water. Oil extraction is costly and sometimes environmentally damaging, although Dr. John Hunt of the Woods Hole Oceanographic Institution pointed out in a 1981 paper that over 70 percent of the reserves in the world are associated with visible macroseepages, and many oil fields are found due to natural seeps. 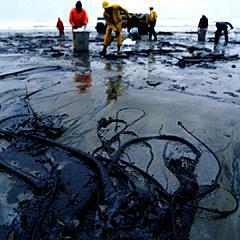 Offshore exploration and extraction of oil disturbs the surrounding marine environment. When burned, petroleum releases carbon dioxide; a greenhouse gas. Along with the burning of coal, petroleum combustion is the largest contributor to the increase in atmospheric CO2. Atmospheric CO2 has risen steadily since the industrial revolution to current levels of over 390 ppmv, from the 180 – 300 ppmv of the prior 800 thousand years, driving global warming. The unbridled use of petroleum could potentially cause a runaway greenhouse effect on Earth. Use of oil as an energy source has caused Earth's temperature to increase by nearly one degree Celsius. This raise in temperature has reduced the Arctic ice cap to 1,100,000 sq mi (2,800,000 km2), smaller than ever recorded. Because of this melt, more oil reserves have been revealed. It is estimated by the International Energy Agency that about 13 percent of the world's undiscovered oil resides in the Arctic. 2) from the atmosphere. This increase in acidity inhibits life such as scallops. Because petroleum is a naturally occurring substance, its presence in the environment need not be the result of human causes such as accidents and routine activities (seismic exploration, drilling, extraction, refining and combustion). Phenomena such as seeps and tar pits are examples of areas that petroleum affects without man's involvement. Regardless of source, petroleum's effects when released into the environment are similar. Countries whose oil production is 10% or less of their consumption. Total world production/consumption (as of 2005) is approximately 84 million barrels per day (13,400,000 m3/d). 2 Canadian statistics are complicated by the fact it is both an importer and exporter of crude oil, and refines large amounts of oil for the U.S. market. It is the leading source of U.S. imports of oil and products, averaging 2,500,000 bbl/d (400,000 m3/d) in August 2007. . In 2013, the United States will produce an average of 11.4 million barrels a day, which would make it the second largest producer of hydrocarbons, and is expected to overtake Saudi Arabia before 2020. 2 Although Canada's conventional oil production is declining, its total oil production is increasing as oil sands production grows. When oil sands are included, Canada has the world's second largest oil reserves after Saudi Arabia. In petroleum industry parlance, production refers to the quantity of crude extracted from reserves, not the literal creation of the product. Oil consumption per capita (darker colors represent more consumption, gray represents no data). According to the US Energy Information Administration (EIA) estimate for 2011, the world consumes 87.421 million barrels of oil each day. Global fossil carbon emissions, an indicator of consumption, for 1800–2007. Total is black, Oil is in blue. Rate of world energy usage per day, from 1970 to 2010. 1000TWh=1PWh. Oil consumption 1980 to 2007 by region. Since the 1940s, agricultural productivity has increased dramatically, due largely to the increased use of energy-intensive mechanization, fertilizers and pesticides. Sulfur or Sulfuric acid. These are useful industrial materials. Sulfuric acid is usually prepared as the acid precursor oleum, a byproduct of sulfur removal from fuels. Petroleum classification according to chemical composition. 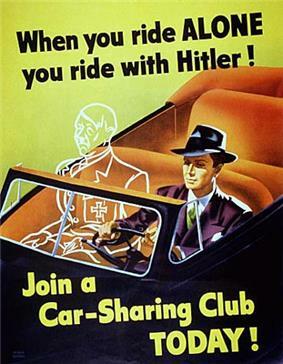 A poster used to promote carpooling as a way to ration gasoline during World War II. The chemical structure of petroleum is heterogeneous, composed of hydrocarbon chains of different lengths. Because of this, petroleum may be taken to oil refineries and the hydrocarbon chemicals separated by distillation and treated by other chemical processes, to be used for a variety of purposes. See Petroleum products. After the collapse of the OPEC-administered pricing system in 1985, and a short lived experiment with netback pricing, oil-exporting countries adopted a market-linked pricing mechanism. First adopted by PEMEX in 1986, market-linked pricing was widely accepted, and by 1988 became and still is the main method for pricing crude oil in international trade. The current reference, or pricing markers, are Brent, WTI, and Dubai/Oman. In the 1950s, shipping costs made up 33 percent of the price of oil transported from the Persian Gulf to USA, but due to the development of supertankers in the 1970s, the cost of shipping dropped to only 5 percent of the price of Persian oil in USA. Due to the increase of the value of the crude oil during the last 30 years, the share of the shipping cost on the final cost of the delivered commodity was less than 3% in 2010. For example, in 2010 the shipping cost from the Persian Gulf to the USA was in the range of 20 $/t and the cost of the delivered crude oil around 800 $/t. In the US, in the states of Arizona, California, Hawaii, Nevada, Oregon and Washington, the Western States Petroleum Association (WSPA) represents companies responsible for producing, distributing, refining, transporting and marketing petroleum. This non-profit trade association was founded in 1907, and is the oldest petroleum trade association in the United States. The petroleum industry is involved in the global processes of exploration, extraction, refining, transporting (often with oil tankers and pipelines), and marketing petroleum products. The largest volume products of the industry are fuel oil and petrol. Petroleum is also the raw material for many chemical products, including pharmaceuticals, solvents, fertilizers, pesticides, and plastics. The industry is usually divided into three major components: upstream, midstream and downstream. Midstream operations are usually included in the downstream category. New York Mercantile Exchange prices ($/bbl) for West Texas Intermediate 2000 through Oct 2014. There are declining amounts of these benchmark oils being produced each year, so other oils are more commonly what is actually delivered. While the reference price may be for West Texas Intermediate delivered at Cushing, the actual oil being traded may be a discounted Canadian heavy oil delivered at Hardisty, Alberta, and for a Brent Blend delivered at Shetland, it may be a Russian Export Blend delivered at the port of Primorsk. The geographic location is important because it affects transportation costs to the refinery. Light crude oil is more desirable than heavy oil since it produces a higher yield of petrol, while sweet oil commands a higher price than sour oil because it has fewer environmental problems and requires less refining to meet sulfur standards imposed on fuels in consuming countries. Each crude oil has unique molecular characteristics which are understood by the use of crude oil assay analysis in petroleum laboratories. The petroleum industry generally classifies crude oil by the geographic location it is produced in (e.g. West Texas Intermediate, Brent, or Oman), its API gravity (an oil industry measure of density), and its sulfur content. Crude oil may be considered light if it has low density or heavy if it has high density; and it may be referred to as sweet if it contains relatively little sulfur or sour if it contains substantial amounts of sulfur. Some marker crudes with their sulfur content (horizontal) and API gravity (vertical) and relative production quantity. On the other hand, kerogen. The kerogen in the rock can be converted into crude oil using heat and pressure to simulate natural processes. The method has been known for centuries and was patented in 1694 under British Crown Patent No. 330 covering, "A way to extract and make great quantities of pitch, tar, and oil out of a sort of stone." Although oil shales are found in many countries, the United States has the world's largest deposits. Oil-eating bacteria biodegrade oil that has escaped to the surface. Oil sands are reservoirs of partially biodegraded oil still in the process of escaping and being biodegraded, but they contain so much migrating oil that, although most of it has escaped, vast amounts are still present—more than can be found in conventional oil reservoirs. The lighter fractions of the crude oil are destroyed first, resulting in reservoirs containing an extremely heavy form of crude oil, called crude bitumen in Canada, or extra-heavy crude oil in Venezuela. These two countries have the world's largest deposits of oil sands. Wells are drilled into oil reservoirs to extract the crude oil. "Natural lift" production methods that rely on the natural reservoir pressure to force the oil to the surface are usually sufficient for a while after reservoirs are first tapped. In some reservoirs, such as in the Middle East, the natural pressure is sufficient over a long time. The natural pressure in most reservoirs, however, eventually dissipates. Then the oil must be extracted using "artificial lift" means. Over time, these "primary" methods become less effective and "secondary" production methods may be used. A common secondary method is "waterflood" or injection of water into the reservoir to increase pressure and force the oil to the drilled shaft or "wellbore." Eventually "tertiary" or "enhanced" oil recovery methods may be used to increase the oil's flow characteristics by injecting steam, carbon dioxide and other gases or chemicals into the reservoir. In the United States, primary production methods account for less than 40 percent of the oil produced on a daily basis, secondary methods account for about half, and tertiary recovery the remaining 10 percent. Extracting oil (or "bitumen") from oil/tar sand and oil shale deposits requires mining the sand or shale and heating it in a vessel or retort, or using "in-situ" methods of injecting heated liquids into the deposit and then pumping out the oil-saturated liquid. The reactions that produce oil and natural gas are often modeled as first order breakdown reactions, where hydrocarbons are broken down to oil and natural gas by a set of parallel reactions, and oil eventually breaks down to natural gas by another set of reactions. The latter set is regularly used in petrochemical plants and oil refineries. Three conditions must be present for oil reservoirs to form: a reservoirs) by impermeable rocks above. However, the process is influenced by underground water flows, causing oil to migrate hundreds of kilometres horizontally or even short distances downward before becoming trapped in a reservoir. When hydrocarbons are concentrated in a trap, an oil field forms, from which the liquid can be extracted by drilling and pumping. An alternative mechanism was proposed by Russian scientists in the mid-1850s, the Abiogenic petroleum origin, but this is contradicted by the geological and geochemical evidence. Geologists often refer to the temperature range in which oil forms as an "oil window"—below the minimum temperature oil remains trapped in the form of kerogen, and above the maximum temperature the oil is converted to natural gas through the process of thermal cracking. Sometimes, oil formed at extreme depths may migrate and become trapped at a much shallower level. The Athabasca Oil Sands are one example of this.